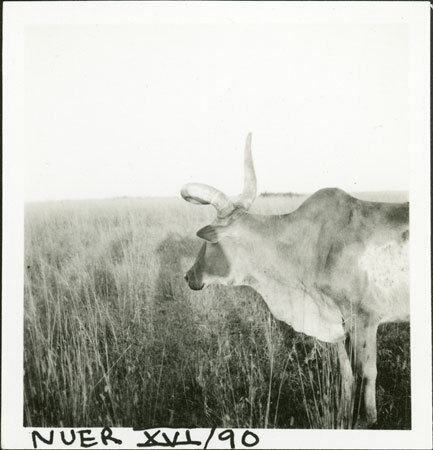 A profile of an impressive ox in Western Nuerland with a trained left horn curving over its muzzle (known as ma gut), a process carried out by by Nuer men by cutting away at one side of the horn on their favourite beasts, for aesthetically pleasing effects. Note on print reverse ms pencil - "4 Nuer cow" & print front border ms ink - "NUER XVI/90"
Morton, Chris. "Nuer ox with trained horn" Southern Sudan Project (in development). 03 Jan. 2006. Pitt Rivers Museum. <http://southernsudan.prm.ox.ac.uk/details/1998.355.797.2/>.